It has come to our attention that a Netflix phishing scam is circulating in the area on various Facebook newsfeeds and through email. 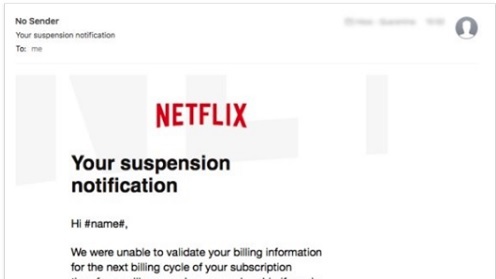 According to Hoax-Slayer (http://www.hoax-slayer.net) this is a phishing scam and Netflix did not send either one. Unfortunately, clicking on the link will take you to a fake Netflix website that will ask for login credentials and updates to your credit card information. If you have received an email or have seen a post on your Facebook newsfeed please do not click on either one. Like many phishing scams those behind this only want to collect your information and commit credit card fraud, and login to your Netflix account. If they are able to collect enough information they just might be able to steal your identity. Remember, these fraudulent scams can be very authentic looking. If you suspect activity on your account that you did not authorize, please contact Netflix immediately at 1.866.579.7172.